Are your tastes too modern for studying historic arts? Why not try a course in photography, animation, comics, video & filmmaking, film acting, multimedia? 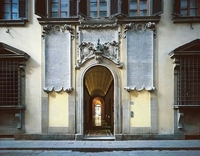 The National Film School of Florence was founded in 1999 by Salvatore Vitiello. The purpose of the school is to give to all those who “love” cinema the opportunity to create, produce or act in their own short and full-length films. The school’s philosophy is to let the students express themselves creatively in a stimulating environment. The student should be able to identify with the work that he or she is producing because it is our belief that in this industry, no matter what you create, it has to have conviction. The school’s name derives from this motto, “National Independent Film School”. It is also a way for us to search out and value new ideas; which are sometimes overlooked by the current film industry. The New York Film Academy has an open enrollment. Serious students from all backgrounds are welcome to apply. No previous experience is required. However, all New York Film Academy Workshops are extremely intensive. Students who enroll should be prepared to live and breathe filmmaking during these workshops. Given the nature of filmmaking and the necessity of working in crews, students must be willing to devote themselves not only to their own projects, but to their classmates’ projects as well. As space is limited, we recommend early application to guarantee a place in the workshop of your choice…. Le specializzazioni sono: Interactive Environments (applicazioni per Internet, installazioni multimediali per l´arte e i beni culturali) e Video post production (computer graphics, effetti speciali e post produzione video). E’ inoltre previsto un periodo di stage in azienda della durata di tre mesi. The Cinema School “Immagina” was born in 1994 thanks to a group of actors, directors and writers but above all thanks to the enthusiasm of an independent film director, Giuseppe Ferlito. The School, respecting independent thoughts, teaches the language of cinema and ways of representing reality. Even if it’s possible to teach the ideas, it can be tough transforming them into cinema: how to write them, how to move the camera, how to direct the actors in order to express complete ideas, concepts, and feelings that we have in the head and in the heart. The Laboratory practice is the principal part of the school, where students of various courses are working together, constructing together a sort of creative interactions with the precise aim to bring the product to an end. The interdisciplinary opens a dialogue between the several sections, already from the first lessons on the students have the possibility begin a deep collaboration based on a common project. Beside the usual creative course in short film production, our films are sent to various festivals of independent cinema each year. The school also gives its students the experience and emotion of a real cinematographic set, including the realization of full-length films that enter the normal cinematographic circuit. Courses in 3D animation, multimedia, photography and video as well as many other in the fine, performance and decorative arts; design; liberal arts; and Italian language. 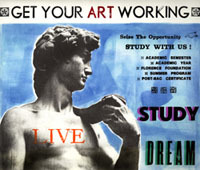 In affiliation with The Art Institute of Florence, we offer a wide range of Studio Art courses at all levels including photography, film, video and multimedia production, in addition to painting, drawing, sculpture and mixed media, interior, graphic and fashion design, fashion marketing and merchandising, jewelry design, printmaking, fine art restorations, ceramics, theater, music, dance, and cooking. We offer courses in video, photography, and digital media, Super8 film, and web design in addition to painting, drawing, and sketching, printmaking, etching, lithography, letterpress, hand press, book works, typography, Italian studies and language. 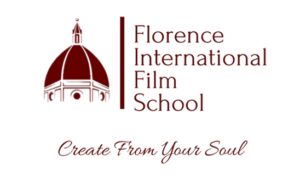 Florence International Film School is located in the direct center of Florence and offers a new perspective on film and acting. Offering a masters program, 4-week intensive course and a 1 year certificate in professional film development, the team at at the Florence International Film School believe in creating an education that connects art with the creative spirit. In addition to the programs offered, they incorporate and provide workshops in performance art, dance & movement, yoga & meditation, among others. Their main focus is to work on developing ones inner artist through growth and exploration. Experienced mentors from all around the world teach the courses offered by this film school.